Cusic tracks every reference to Churchillian music and song. They range from the marches, ditties and Gilbert & Sullivan Churchill loved to his favorite hymns. An outstanding collection of London and other photographs cast Churchill’s life as an architectural biography. Normandy and Beyond demonstrates enormous mass of detail Churchill had to deal with around D-Day. Antoine Capet makes a case study of the ever-present de Gaulle problem. Sandys describes her grandfather’s paintings with four characteristics, which she also applies to his approach to life: bold, irrepressible, loving of life, and inspiring. The premise advanced by Felix Klos is all wrong. Winston Churchill wanted Britain to be “with” Europe, but not a part “of” it. David Owen with his government experience provides insight, though not enough of it, on War Cabinet machinations in the power struggle of May 1940. 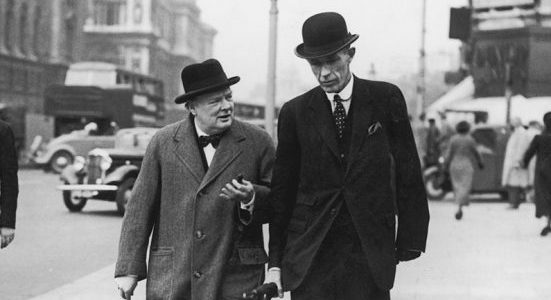 Churchill on Fisher: “I am glad we were friends in the end.” Was his love for the admiral an error of judgment? Barry Gough has the answers. The “book to go with the film” by Andrew McCarten falls short of the movie. It supposes Churchill was an ordinary man. In the movie, he is anything but. In his review of "Churchill Warrior," Dr. Sterling touches on how Brian Lavery balances conciseness with a gripping narrative. Michael McMenamin smartly praises Shakespeare's "Six Minutes In May" for its coherent, fascinating account of Churchill's rise to power in conjunction with Hitler's aggression in the West.